What the heck happened to Kool Dogz? During the summer months, I enjoy to eat and drink things that are ice cold. I enjoy ice cream, iced tea, frozen daiquiris and cold salads to name a few. It seems to help keep my body temperature at a comfortable level. Why would dogs be any different? Actually, I think they might even appreciate ice cold treats more than I do since they (or most of them) are covered in a fur coat. 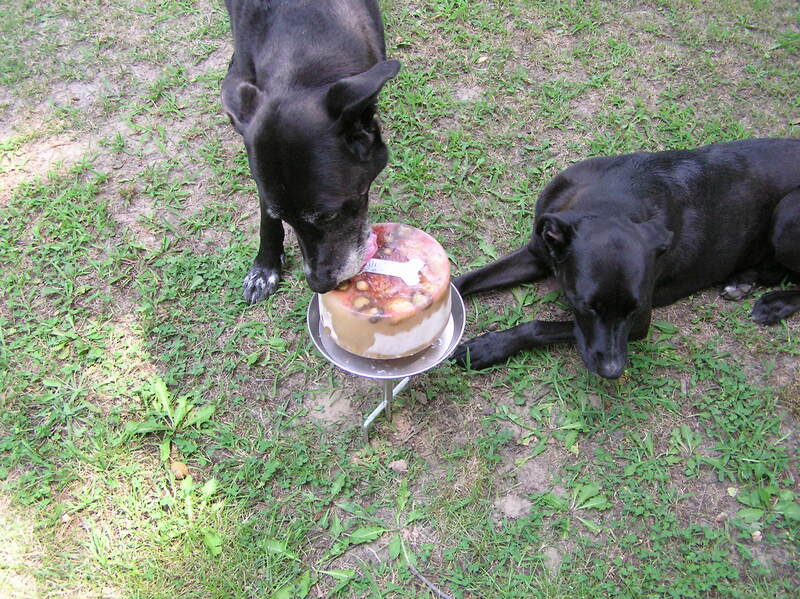 I have made frozen treats (I like to call them Pupcicles) for my dogs for as long as I can remember. I like to take plain yogurt and mix it with whatever my dogs like (bananas, peanut butter, ground liver, cantaloupe, watermelon, … the possibilities are endless), then I put the mixture into a mold and freeze it. 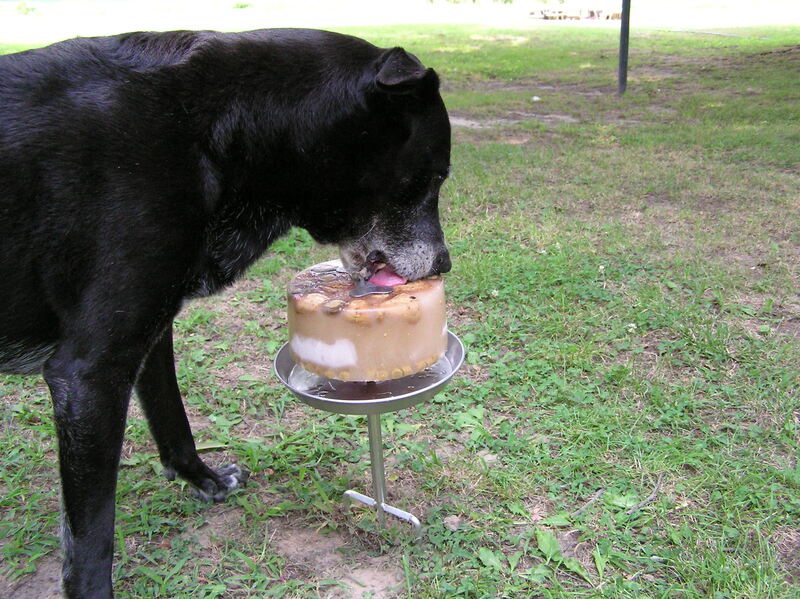 On hot days I pop a Pupcicle out of the mold and give it as a treat. CJ loves them! His favorite flavors are peanut/almond-butter & banana, cantaloupe, watermelon, fig, and berry (strawberry, blueberry, raspberry, blackberry or any combination). I think he has a bit of a sweet tooth. 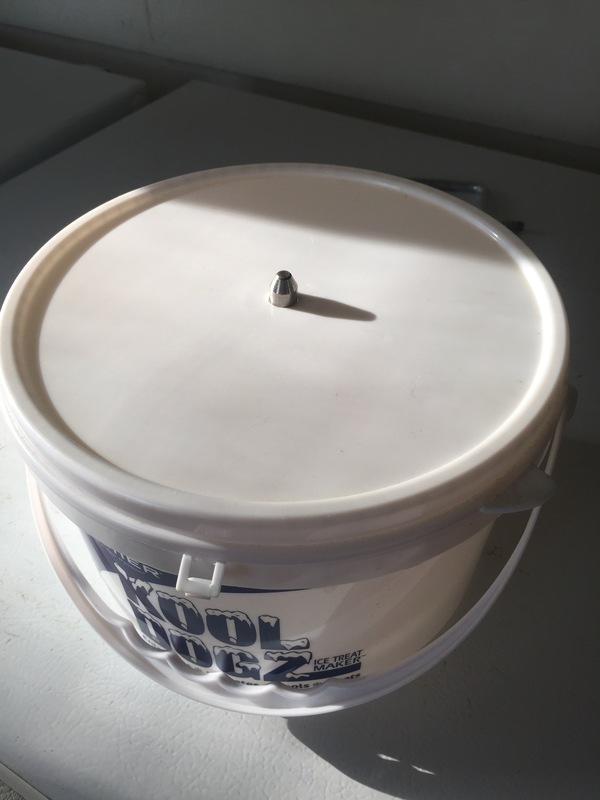 About 15 (or more) years ago I heard about this ice treat maker called Kool Dogz, manufactured by Premier Pet Products. 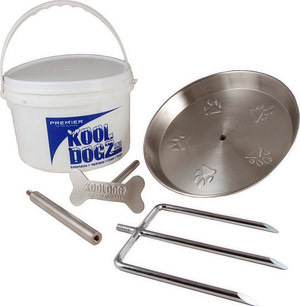 I thought it was a pretty “kool” product myself, but never bought one because I was making my own pupcicles anyway. Fast Forward 5+ Years: We moved from the Mojave Desert to the Eastern Shore of Virginia in 2007. We went from super-hot and dry to hot and humid. Whether or not it was the weather or the age of my dogs after the move, they seemed to tolerate hot and dry much better than hot and humid. Pupcicles went into continuous rotation in the freezer! Then I remembered the Kool Dogz and decided to order one. Best decision ever! There is a bucket (the mold) that allows you to easily combine whatever you want to add to the treat. That bone-shaped thing attached to a bar is the centerpiece of the mold. Once you get your stuff mixed, you place the centerpiece in the bucket with the bone to the bottom of the bucket. There is a little hole in the bucket’s lid that the other end of the centerpiece fits through to hold it in place during freezing. 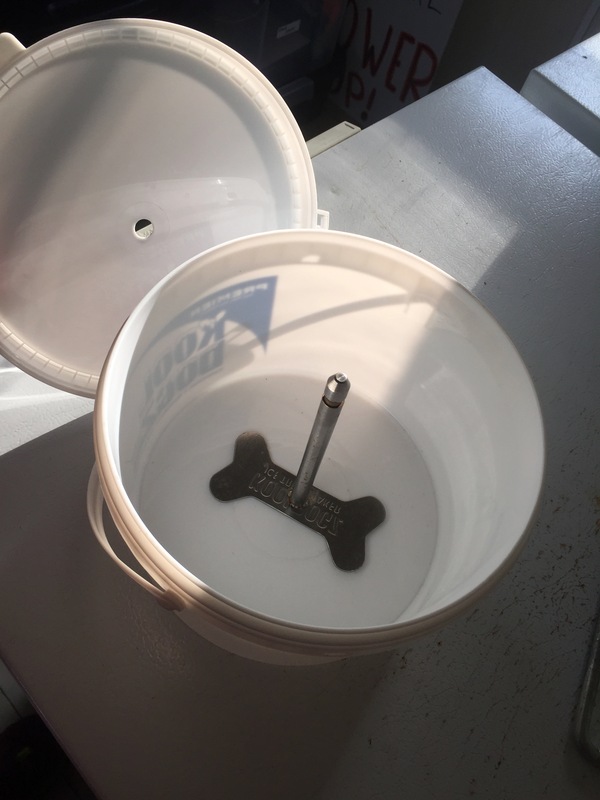 Once frozen, you remove the lid and slide the ice block out of the bucket and place the end of the centerpiece opposite the bone into the center hole of the drip pan. The fork screws into the bottom of the drip pan holder so that you can fix it into the earth. Voila! 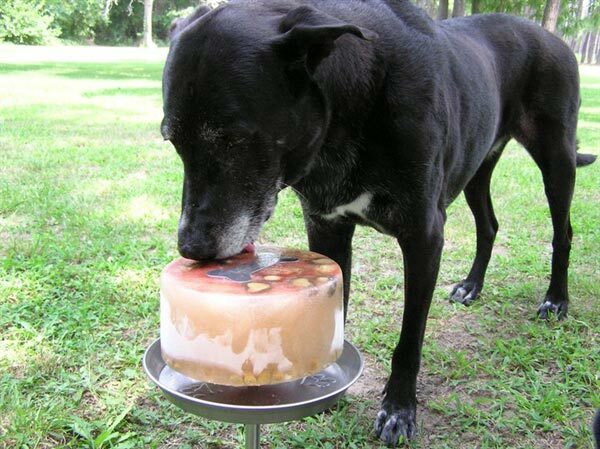 Long-lasting ice-treat for your dog!!! You can freeze anything in this! You can freeze food, treats and favorite toys that are small enough to fit in the bucket (Kong toys, ball toys, West Paw toys, etc.) in the mold. Chompers and C.J. both loved the Kool Dogz! However, they did not love it together. If Chompers was working on the treat, C.J. would stay away. Good boy, C.J. If C.J. was at the treat, Chompers would come over to join in, but then C.J. would either move away from it (which was fine) or would lift his lip and warn Chompers not to come any closer (Jerk!). To allow each dog equal time at the treat, I would let them out in shifts. First Chompers (because he was older, wiser and not ever a jerk) for 5-10 minutes, then C.J. for 5-10 minutes. This worked quite well for the first summer. Chompers enjoying his Kool Dogz ice treat! Chompers enjoying his ice treat while CJ lingers. CJ during one of his Kool Dogz shifts! The following summer I decided I should just have two of these things. One for each dog and/or so that I could always have one in the freezer. I first tried to order another through our direct account with Premier at the animal hospital. They were out of stock. So I went onto our other supplier’s website and they didn’t have them available either. Next I went online to try to find one through Amazon, or Chewy or anywhere. Nobody had them. They were either listed as out of stock or unavailable. Some time later we learned that Premier products had been taken over/bought out by another company called RadioPet. The distributor explained at that time that, because of the change, some products were being discontinued. Kool Dogz was one of those products. 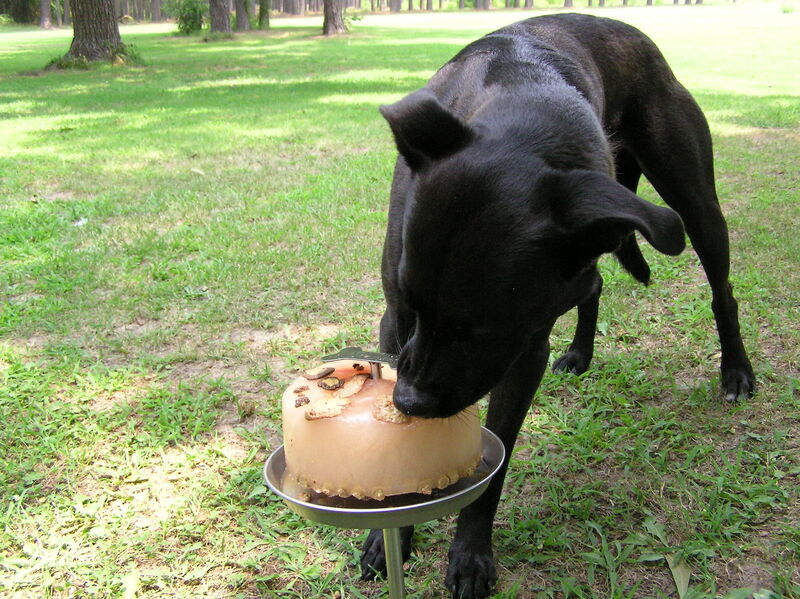 Not long after Premier products became products of RadioPet, those products then became products of PetSafe. When this change happened I thought I’d try to find the Kool Dogz (or anything remotely similar to it) again. Nada. Just this week the topic came up at work about Kool Dogz, likely because summer is approaching and we have had some lovely warm days in May. In an effort to locate the product itself or something similar, we did a Google search of Kool Dogz. Some of our newer peers didn’t know what it was we were seeking, so I clicked on the images tab in the Google search bar. I didn’t have to scroll very far until I did a double take (which was really a quick scroll back on the mouse). Something caught my eye. When I scrolled back up, there it was. My heart kind of melted a bit. That’s my late Chompers enjoying his Kool Dogz treat, circa 2013! I’m not entirely sure on my timeline, but judging by his grizzle it has to be somewhere between 2012 and 2014. 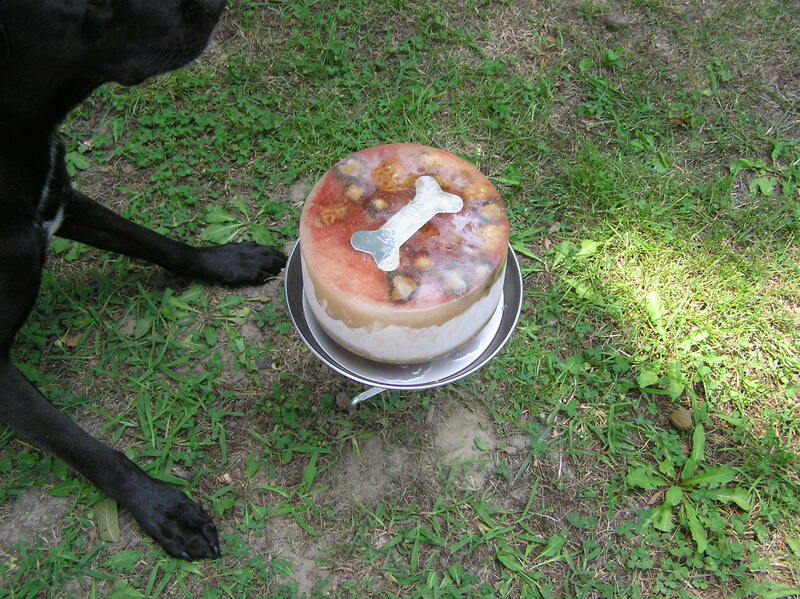 His photo has been exploited on an Italian website promoting Ice Treats for dogs! I’m totally fine with this. I was quite … taken with emotion that he was chosen to represent this article. But, now, I want to know WHY ON EARTH has PetSafe, or one of their competitors, NOT tried to recreate this product?! It is so great! I have tried to figure a way to rig something else up to duplicate it to no avail. I have to admit that my attempts have been lackluster since I do own a Kool Dogz (and I will be hanging on to it!). I petition that PetSafe bring back Kool Dogz. Who’s with me?